At the St Lucia Field Station in Dennery attendees including specially invited schools got the opportunity to see some aspects of the field work under the project. They received a guided tour of the coconut nursery and learnt about other aspects of the Unit’s work such as the establishment of a germplasm bank to conserve unique varieties of coconuts and the establishment of an IPM plot to study and develop management strategies for the troublesome Red Palm Mite. To test their understanding, a Q & A session was held and students rewarded with prizes donated by corporate entities and local partners. A variety of exhibitors who are involved in value added product development also got an opportunity to showcase their products such as flour, soaps, oils, handicraft and confectionaries. In Grenada, CARDI Day celebrations at National Stadium updated stakeholders on some key aspects of the Unit’s research and development activities. Soursop has been identified by the Government of Grenada as a crop of economic importance, CARDI is supporting the country’s drive to increase the acreage under soursop production by conducting hand pollination trials. CARDI Representative, Reginald Andall also updated on the establishment of the sweet potato innovation platform and the strengthening of the cassava value chain. Several hurricanes in the past have affected the country’s coconut plantations, once a principal source of livelihoods in the rural communities. The country like the rest of the Region is on the drive to rehabilitate the industry. Reginald Andall said at that the last COTED and Alliances Meeting held during the Caribbean Week of Agriculture, Executive Director, Barton Clarke requested that Grenada be added to the list of project countries for phase II of the Regional Coconut Development Project set to commence in 2019. Over in St Kitts and Nevis, CARDI hosted a forum at the Department of Agriculture to apprise stakeholders on the work of the Institute in 2018 and to preview the Unit’s work programme for 2019. CARDI Representative Kistian Flemming presented on an innovative solution the Unit is developing to bypass some of the production challenges that farmers on the island face. The conversion of shipping containers to agricultural production systems offers farmers solutions to some nagging problems such as the unavailability of land, pests and climatic challenges. Based on projections the system which only occupies a space of 320ft2 can produce approximately 6,400lbs of leafy vegetables. Together with Wageningen University (WUR) the Institute conducted an assessment of soil risk erosion in agricultural areas. Using Geographic Information Systems (GIS) and modelling tools, results showed that the majority of farmers were located in high erosion risk zones. In 2019, the Unit will be working on a sustainable land management programme in these areas as most of these farmers are not currently practicing any erosion risk reduction measures. Participants were apprised of the Regional Coconut project and learnt that a coconut programme is being developed by the Unit for implementation in 2019-2020. It will focus on the introduction of disease resistant coconut breeds and entomological support, the promotion of food safety quality measures and enhanced germplasm management capacity. A number of artisans, processors, entrepreneurs and farmers used the CARDI day platform to display their coconut based value added and by-products in St. Vincent and the Grenadines. The exhibition jointly hosted by CARDI and the Ministry of Agriculture also exhibited a number of food based products including water, confectionaries and savoury dishes. CARDI Representative, Greg Linton said that the project brought to the fore the many opportunities available for stakeholders along the coconut value chain in St Vincent and the Grenadines to improve their income and employment opportunities. However to support this, he called for a robust replanting/ planting programme on the island. On hand to assist persons interested in establishing a coconut based business was the Bureau of Standards. Their representatives showcased the services available for persons involved in the coconut industry and for prospective entrepreneurs. Jennifer Douglas-Bullock, the Bureau’s Representative, explained that they offer a range of services for persons who need information on standards within the coconut industry, food safety information applicable to the processing of coconut, its uses, and a range of products which can be had from it. Support like this is critical to transition these small businesses into profitable, competitive enterprises if they are to tap into the growing regional and international markets for coconut products. 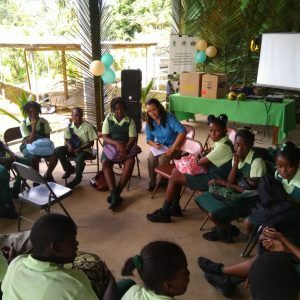 CARDI in collaboration with the Youth Development Division, Ministry of Agriculture and Fisheries hosted seven, 4-H clubs to celebrate CARDI day at the Goodwill Primary School, Dominica. Presentations on the importance of the coconut industry to the Region and Dominica and the uses of the tree among other topics were made by the CARDI team. The targeting of youths for this exercise was deliberate as Dominica is in the process of rebuilding its agriculture sector following the devastating impact of Hurricane Maria. Every opportunity must be used to educate youths on the importance and value of the sector as their involvement is critical in crafting a resilient, sustainable and competitive sector. Coconuts in particular is a viable option as it offers many opportunities to farmers, processors and agripreneurs. From an environmental perspective it is an important feature of agriculture systems because of its inherent resilient nature.